Investigators looking for missing Malaysia Airlines flight MH370 have begun their last sweep of the 120,000-sq-km search area in the Indian Ocean. MH370 disappeared in March 2014 with 239 people on board. Its whereabouts have become one of the world’s greatest aviation mysteries. The relatives of the passengers want closure and are determined to continue the search. This is a story of unbearable pain, terrible confusion and some hope. What is bringing the official search to an end? The final official act in the nearly 1000-day old hunt for the missing Malaysia Airlines flight MH370 - a Boeing 777 - has begun. MH370 was carrying 239 people when it disappeared en route to Beijing from Kuala Lumpur. Several ships have desperately combed the seabed of a vast search area in the Indian Ocean since the plane disappeared in 2014. Today, the Dutch vessel Fugro Equator is the only ship still involved in the search operation. 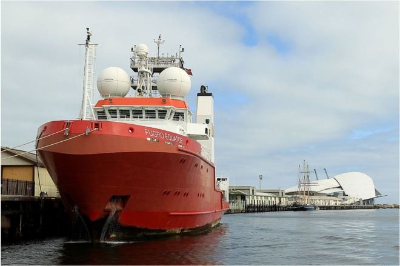 Even the Fugro Equator has now begun its ‘final sweep’ and is expected to finish scouring the final portion of the search area by early 2017. MH370 will remain an unsolved aviation mystery unless the last sweep yields any credible evidence. The chances of clues surfacing in the final act are bleak considering that not a single piece of wreckage or any clues to the whereabouts of the plane have been found so far by the operation. 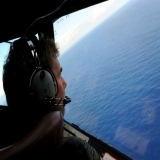 "It has been an heroic undertaking but we have to prepare ourselves for the prospect that we may not find MH370 in the coming weeks, although we remain hopeful," Australian Transport Minister Darren Chester told.Australia is leading the joint investigation which also involves China (most of the passengers were Chinese) and Malaysia (it was a Malaysian flight). The families of the missing passengers have expressed frustration at the lack of concrete evidence turned up by the official search, and have called for a coordinated effort to search beaches for debris. Why does this mystery remain unsolved? 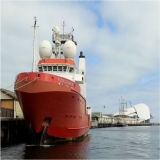 The Australian-led search has been combing a 120,000 sq km area of seabed about 2,000km off the coast of Perth, using advanced underwater drones and sonar equipment deployed from specialist ships. The scope of the search changed many times since the plane disappeared, because of confusion over its last movements. No distress signal was sent by the pilot (or the co-pilot) before the plane vanished. There is no record of where exactly MH370 was at the time its transponder was shut. Despite an extensive search of the southern Indian Ocean, no trace of the aircraft was found until the discovery of a flaperon on Reunion Island (in France), more than 3,700km away from the main search site, in July 2015. French investigators confirmed the aircraft wing part came from the missing Malaysian Airlines Boeing 777, after one of three numbers found on the flaperon was formally identified by a technician from Airbus Defense and Space (ADS-SAU) in Spain, which made the part for Boeing. 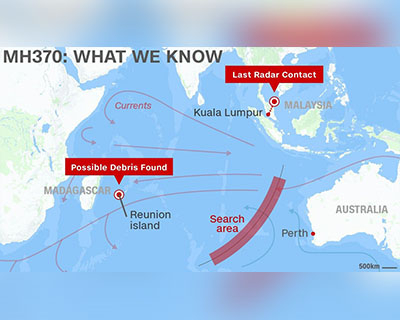 In December 2015, Australian officials said they had refined the search area based on backward calculations from the location of the Reunion debris and were confident “they were looking in the right area for the plane”. Australia's Deputy Prime Minister Warren Truss said officials were "optimistic" the remains of the plane would be found by the middle of 2016. That optimism was clearly unfounded. If they knew why there were wrong, they would have found the plane.No one knows where the main body of MH370 is. 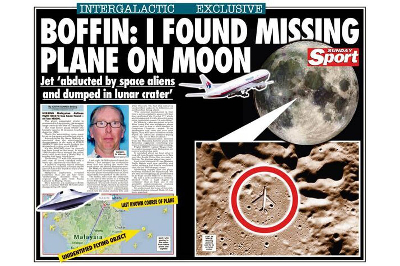 Such is the mystery that alien hunters are claiming to have spotted an intact MH370 “much below the ground” or “up in the space”. Many algorithms have been written by the best experts to predict how the debris would have drifted (a technique called Drift Mapping) - none of them have worked so far. 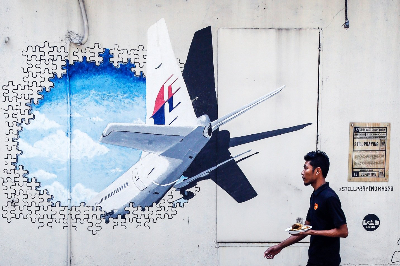 When exactly did MH370 go missing? 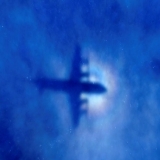 “The disappearance of flight MH370 is probably one of the most bizarre events in modern history,” says Eric Jansen, an Italian researcher who has worked on the mystery. It is surprising that the debris have not been found. Malaysia Airlines says the plane lost contact less than an hour after takeoff. No distress signal or message was sent. The most surprising part, however, is that in spite of all modern communication systems being available, there was no indication of a technical snag from the pilots. In fact, the plane disappeared very peacefully. 00:41, 8 March 2014: Malaysia Airlines Flight MH370 departed from Kuala Lumpur International Airport and was due to arrive in Beijing at 06:30. 01:07: The plane sent its last ACARS transmission - a service that allows computers aboard the plane to "talk" to computers on the ground. Sometime afterwards, it was silenced and the expected 01:37 transmission was not sent. 01:19: The last communication between the plane and Malaysian air traffic control took place. At first, the airline said initial investigations revealed the co-pilot had said "All right, good night". However, Malaysian authorities later confirmed the last words heard from the plane, spoken either by the pilot or co-pilot, were in fact "Good night Malaysian three seven zero". The choice of words has added weight to the theory that the pilot(s) crashed the plane deliberately. A few minutes later, the plane's transponder, which communicates with ground radar, was shut down as the aircraft crossed from Malaysian air traffic control into Vietnamese airspace over the South China Sea. 01:21: The Civil Aviation Authority of Vietnam said the plane failed to check in as scheduled with air traffic control in Ho Chi Minh City. 02:15: Malaysian military radar plotted Flight MH370 at a point south of Phuket Island in the Strait of Malacca, west of its last known location. Thai military radar logs also confirmed that the plane turned west and then north over the Andaman Sea. 02:28: After the loss of radar, a satellite above the Indian Ocean picked up data from the plane in the form of seven automatic "handshakes" between the aircraft and a ground station. The first was at 02:28 local time. It means that the technical systems of the plane had not shut down by this time (though it may have crashed). This is similar to a phone call that just rings because no one is on the other end to pick it up and provide information. It would take 7 more hours for the Malaysian authorities to realize the MH370 had gone missing. 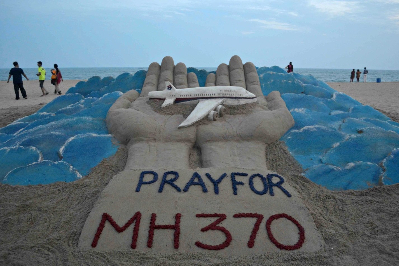 Many aviation experts feel it is weird that it took the Malaysians so long to know the plane was gone. Even a delay of 10 minutes in relaying signals usually sends the alarm bells ringing. Where do the conspiracy theories come from? Humans want closure. When they cannot find one, their imagination creates explanations. Then those explanations get distributed far and wide through the social media. It is usually forgotten that in tragic accidents, the only people who suffer in the long run are the family members of the missing and the dead. David Aaronovitch, author of Voodoo Histories: The Role of the Conspiracy in Shaping Modern History, captured the source of such theories:"Given that people can make conspiracy theories out of something that is fully explained, like the moon landings, it's not surprising that they will fill the void in a genuine mystery with conspiracy theories. Essentially these people can't face the thought of chaos.They can't face the role of accident and contingency in life; they have to attribute agency." The Bermuda Triangle: The plane didn't actually fly anywhere near Bermuda, but some people – including one Malaysian minister – pointed out that the area where MH370 vanished is on the exact opposite side of the globe to the Bermuda Triangle. Shouldn’t that have the exact opposite effect then ! High-tech hijacking: The disappearance of flight MH370 may be down to the world’s first cyber hijack, according to the Sunday Express. It says that hackers could have accessed the aircraft’s flight computer and reprogrammed the speed, altitude and direction.“It could then be landed or made to crash by remote control,” the paper suggests. It may be worth noting that the woman who came up with this theory “runs her own company training businesses and governments to counter terrorist attacks”. HAARP caused flight MH370 to crash: Bringing together two favourite subjects of conspiracy theorists, some have suggested that the US government's recently closed HAARP research facility could have caused the Malaysian Airlines flight to crash. 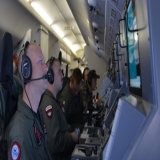 "Could HAARP be an explanation for the puzzlement that surrounds the mystery of what has happened to the plane " asks one contributor to Godlike Productions – a self-described "conspiracy theorists and lunatic fringe" website. We will leave it that. The High Frequency Active Auroral Research Program (HAARP) was an ionospheric research program to analyze the ionosphere and investigate the potential for developing ionospheric enhancement technology for radio communications and surveillance. It was shut down in May 2014. A weapon like no other: Writing for NaturalNews.com (which does not focus on nature), Mike Adams says that the plane's disappearance shows that "some entirely new, mysterious and powerful force is at work on our planet which can pluck airplanes out of the sky without leaving behind even a shred of evidence". If a weapon capable of making a plane disappear without trace does exist, then "whoever controls it already has the ability to dominate all of Earth's nations with a fearsome military weapon of unimaginable power", Adams writes. The aliens may be. MH370 itself is a weapon: This is a popular theory. The proponents of the theory suggest that the plane could have been flown to a safe place, landed and camouflaged and may, at some point, be used to commit a 9/11-style attack. One offshoot of this theory claims Israel (can it even be out of any theory) has hijacked the plane and wants to (take a deep breath for what is about to follow) carry out a 9/11 type attack and blame Iran for it. Another offshoot claims Vladimir Putin took the plane. The plane is right there - but it is invisible: According to reports, 20 employees of Freescale Semiconductor, a company that develops "cloaking" technology were onboard the MH370 when it went missing. Some, such as the writers of WorthyToShare.com (not worthy of being shared), have speculated that the plane may have been turned invisible and landed somewhere, possibly at the US Air Force base in Diego Garcia. Insurance scam: Someone on that plane did not want to die but needed the huge insurance amount that would become due to the family members of the dead. Surprisingly, the souce of this theory is a government officer. "Maybe somebody on the flight has bought a huge sum of insurance, who wants family to gain from it or somebody who has owed somebody so much money, you know, we are looking at all possibilities," said Tan Sri Khalid Abu Bakar Malaysia's Inspector-General of Police. Whose fighting spirit must be celebrated? There are things only family does for family. Even as official investigators prepare to give up, many family members of the missing people have sworn to not end their search till they find the truth. Grace Nathan, spokeswoman for the Voice370 campaign group, said the discovery of debris potentially from the plane brought “mixed feelings” for the whole group.“First time a piece was found by one of us. Such mixed feelings now for all of us – pain, sadness, confusion, hope,” she wrote on a Facebook page where the relatives share updates. “We want the world to know that just because the search is about to end, that doesn't mean to us that the search is ending," Nathan said. "There is still a lot at stake." How does the hope finally rest in one man? After two and a half years, despite the multi-million-dollar investment and continuous efforts of three countries, the plane has not been found. That does not deter Blaine Alain Gibson from running a hunt for MH370. If one man is to ever find the wreckage, it is Gibson. A dedicated traveller and a lawyer, Gibson had been moving from country to country with no overarching purpose. MH370 and the plight of the families of the missing (he met them in 2015) gave him the purpose of this life. "I was touched by the plight of the families," he said. "I just couldn't imagine how they felt, knowing nothing about their loved ones for a year. So I just decided, I'll go look for it for myself." For an entire year Gibson visited beaches from Malaysia to Mauritius to the Maldives. 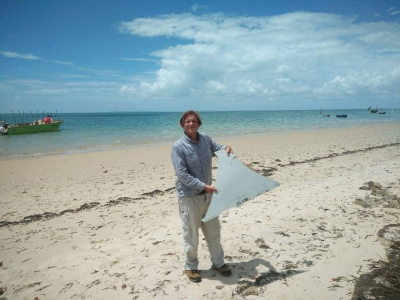 Then one ordinary day in Mozambique, scanning a coastal sandbank, he saw something that didn't belong there. When he picked up the triangular piece of debris from the sand, it was lighter than he expected. But he felt immediately that it was from MH370. Air crash investigators working on the case have since said it "almost certainly" is. He is currently in Madagascar with the few family members who have gathered to search the beaches. Gibson has no illusions about his capabilities. He sees himself as an important addition to the main search, someone at ground level, in among the sand and tall grass, talking to locals. Some call it an obsession.He calls it a quest. He empathizes with the families. But his search for the wreckage also fits in well with his love of travelling and his ambition to visit every country (he has already visited 177). It's clear that there is a powerful love of mystery involved. He wants to be the one who solved the mystery no one could solve.